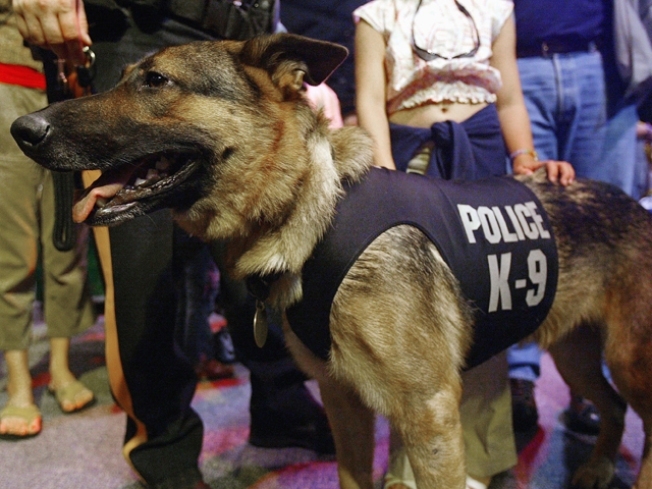 People who intentionally kill police dogs or dogs involved in search and rescue operations may soon face stiffer penalties in New Jersey. The Assembly is set to consider legislation this week that would mandate minimum five-year prison terms — with no chance of parole — for such offenders, who would also face fines of up to $15,000. The current maximum sentence they now face is just three to five years in prison. The measure — named for a police dog killed in the line of duty last November — was passed by the state senate earlier this year, so it would head to Gov. Chris Christie's desk if the Assembly gives its approval on Monday. On the day he died, Schultz had helped track down a robbery suspect and sunk his teeth into the man's forearm. But the suspect then swung his arm, and the dog was thrown into the path of an oncoming car, which struck and killed him. He was later memorialized with full police honors at a ceremony which drew large crowds and media coverage. "Dogs that assist law enforcement are loyal allies in the fight against crime," said Ruben Ramos Jr., D-Hoboken, one of the bill's primary sponsors in that chamber. "This dog, like many others, was simply doing his job serving and protecting the public. They deserve legitimate protection against abuse, and those who abuse them need to face severe punishment." Besides Ramos, other primary sponsors in the Assembly are Democrats Paul Moriarty of Turnersville, Charles Mainor of Jersey City and Gilbert "Whip" Wilson of Camden. It was initially considered by the Law and Public Safety committee, which gave its approval in March. In the senate, the bill was sponsored by Fred Madden, D-Turnersville, who served 28 years with the New Jersey State Police, and Donald Norcross, D-Camden. It was passed by that chamber in February by a unanimous 40-0 vote. Madden said police dogs are "vital parts" of the law enforcement agencies they serve with, so killing one should be viewed no less harshly than assaulting a police officer. "Schultz died in the line of duty doing exactly what he and every police dog has been trained to do — hunt down criminal suspects and help their human handlers arrest them so they can be brought to justice."